The Datrek Trekker Ultra Lite stand bag is ultra-lightweight at 3 pounds. It features a 4-way top with a soft-grip integrated lift assist handle and full-length individual dividers for club protection. 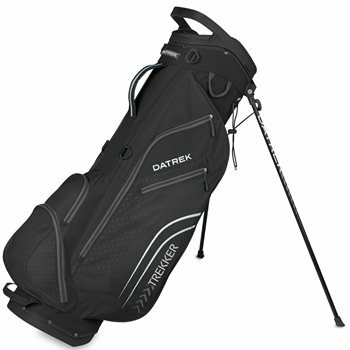 The stand bag also features an insulated cooler sleeve; an umbrella holder; a towel holder; a rain hood with dual access; ergonomic double shoulder straps; a cushioned hip pad and lightweight durable stand legs with slide-resistant traction feet. The Trekker Ultra Lite stand bag is equipped with 5 zippered pockets that include a side panel pocket, a fleece-lined valuables pocket, an accessory pocket, a full size garment pocket and a full-size ball pocket.